This western outfit was worn by the character "Wyatt Earp" portrayed by actor Kevin Costner in the 1994 epic western film "Wyatt Earp", starring Dennis Quaid and Gene Hackman. 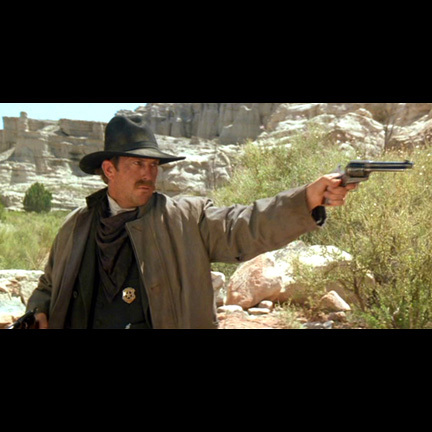 Mr. Costner wore the duster, striped pants and cream shirt in the canyon shootout scene finale during Earp’s Vendetta Ride against the remaining Cowboy Gang, to avenge the death of his brothers who were killed at the OK Corral. During the famous gun battle Wyatt miraculously avoids getting wounded as numerous bullets pierce through his duster missing his body by inches. This outfit was also the signature look that was used as the main image for the movie poster, DVD jackets and other promotional materials for Wyatt Earp. 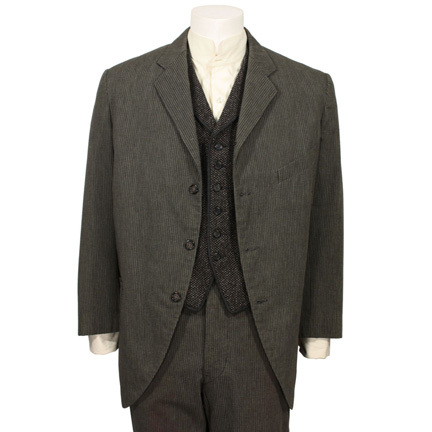 The frock coat, vest and neckerchief shown with this outfit are not the pieces seen in the Canyon Shootout, as the original pieces were returned to costume house stock at the end of filming and are no longer available. 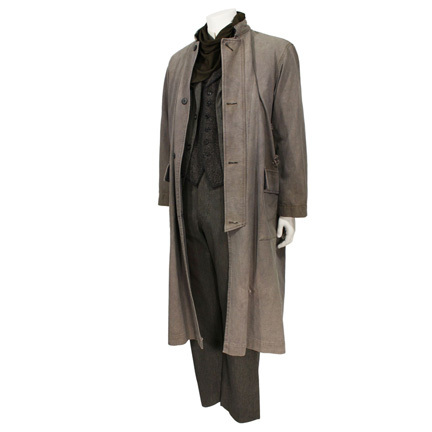 The striped frock coat was made as a suit with the outfit’s striped pants, but the scenes with Mr. Costner wearing the full suit were cut from the film. 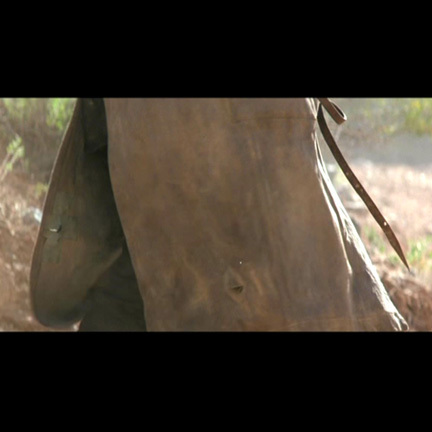 The matching pants were worn often throughout the film and can be seen clearly in multiple scenes in addition to the Canyon shootout sequence. 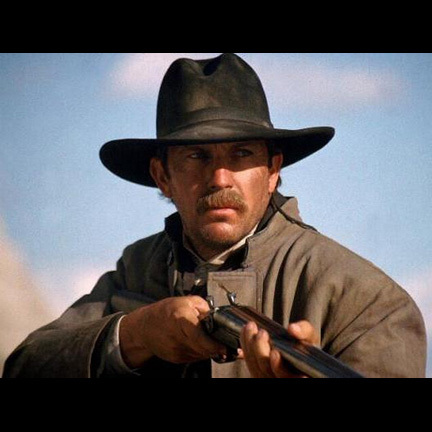 The vest is part of Wyatt Earp’s wedding suit, which Mr. Costner wore during the sequence where a young Wyatt marries his sweetheart "Urilla" (portrayed by Annabeth Gish) in an outdoor ceremony in the company of their friends and families. All of the costume pieces were custom made for Mr. Costner, and were hand distressed by costumers for their use in filming. 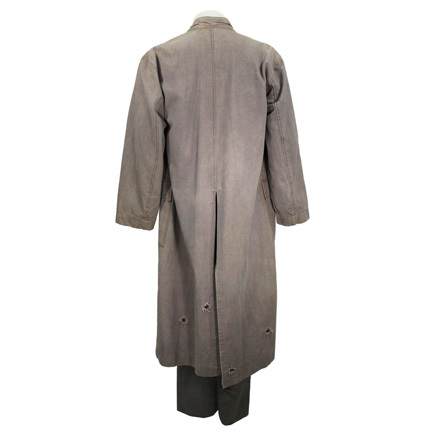 The unlined grey duster is made of heavy cotton, has exterior patch pockets, a long back vent and a narrow stand collar lined with leather. It has numerous bullet holes as seen in the film, with traces of the tape that held the squib charges, which created the bullet holes during filming. The costumers tag is pinned to the interior with “K. Costner as W.E., Sc. 209” written in black ink, and the Motion Picture Costume Co. tag is stitched to the inside back with “MP 621, K. Costner, ‘Wyatt Earp’” typed in black ink. The cream button front long sleeved shirt has a small raised diamond pattern, a narrow stand collar and French cuffs, and has the initials “K.C.” written in the neckband with black ink. The six-button black and grey diagonal weave vest has a rounded notch collar and black trim around all edges and each of the four vest pockets. 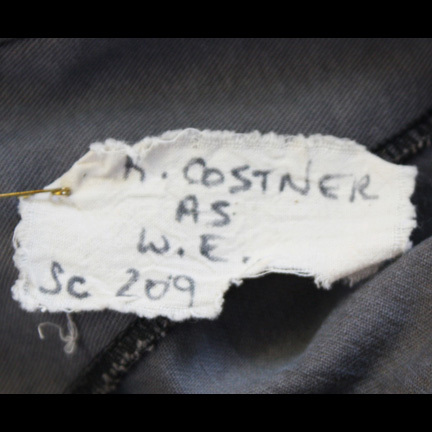 The MPCC tag is stitched to the inside of the neck, also with “MP 621, K. Costner, ‘Wyatt Earp’” typed in black ink. 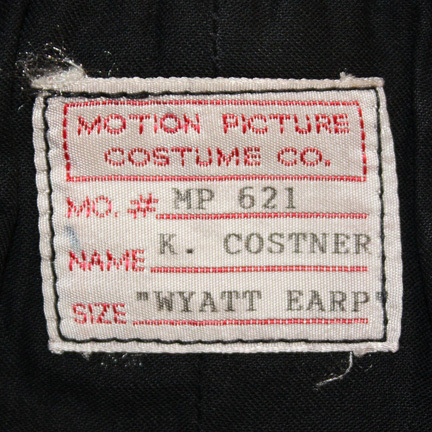 The black and brown striped suit has an MPCC tag with “WE 621, K. Costner, ‘Wyatt Earp’” stitched to the inner breast pocket of the frock coat, and another blank MPCC tag in the pants waistband. The black and brown cotton neckerchief has an MPCC tag with “K.C.” handwritten in black ink. 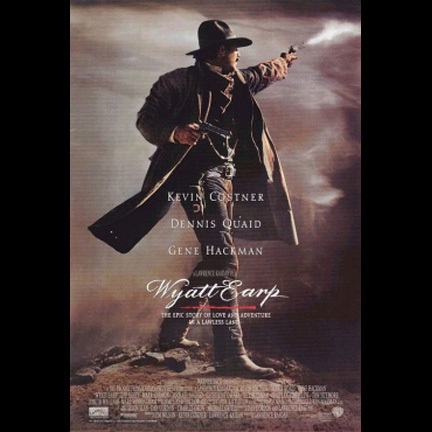 "Wyatt Earp" was nominated for an Oscar for Best Cinematography in 1995 as well as winning the award for Best Drama Script by the Western Writers of America.